Design and create: beaded, fabric, and button bracelets to gift and trade with your friends. Springtime conjures up wonderful images of flowers blooming and birds singing, and in Barberton it also signals the return of the swans to Lake Anna. Today, Lake Anna is blessed with the presence of two swans, which are a popular attraction in the downtown Barberton area. 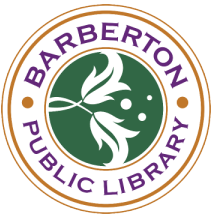 Learn how the swans came to Barberton. Get a Library Cat's Meow! Add one of the 100 Cat's Meow Village keepsakes of the library to your Cat's Meow collection. The keepsakes document the new building facade, where the atrium used to stand. The keepsakes are being sold for $10 at the Customer Services Desk at the Main Library and at the Community Health Branch located on the first floor of Summa Barberton Hospital. Read more about Get a Library Cat's Meow!